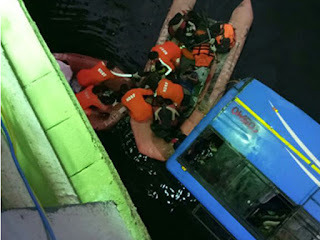 Murshidabad (West Bengal) [India] Jan. 29 : At least 24 people were killed on Monday after a bus drowned in a canal in West Bengal's Murshidabad. The bus with 50 passengers on board fell off the Balighat bridge while crossing it. At the time of filing this report, 24 people had died. A team of the National Disaster Response Force (NDRF) is engaged in the rescue operations.